Onto each piece of matza, pour about a teaspoon of the caramel. Then place 5 cashews around the caramel, sticking out one of the ends of each cashew. 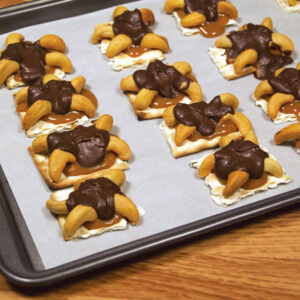 Pour the chocolate on top of the center to cover the middle part of each turtle. Sprinkle each with some sea salt. Set aside until the chocolate solidifies. Recipe by- Teen Chef, Eitan Bernath, recently honored with the “Rising Star” award at KosherFeast 2016, is a weekly food blogger, recipe developer, food photographer, and well-known kosher personality, at the age of 14. Since appearing three years ago on the Food Network show “Chopped”, Eitan has had a busy professional life. He works as a brand ambassador for his corporate sponsors, gives cooking demos all over the tri-state area, develops recipes, and is regularly invited to attend kosher foodie events.